"Get to the Rock Store, now!" It was 2 a.m. on November 9th when Rich Savko's cell phone rang. Groggy, he recognized the number of the local sheriff. Phone calls from law enforcement in the middle of the night are always bad news. When he answered, he heard the panic in the sheriff's voice as he spoke those six words. So Savko jumped in his car and sped toward the mountains, toward the business his parents opened in 1961, toward the Rock Store, the little diner on Mulholland Highway that's become a cultural gathering point for motorcyclists across California and beyond. Twelve hours had passed since the ferocious Santa Ana winds whipped a small brush fire in nearby Simi Valley into an unstoppable inferno. The Woolsey Fire marched south to the sea with Shermanesque fury, roaring through dry washes and desiccated grass hills. The land was parched and ready to burn—there was nothing to be done. A number of homes had already been lost, and with air tankers grounded by 60 mph wind gusts, firefighters had no real way to halt its advance. The Rock Store lay directly in its path. The Woolsey Fire burns in nearby West Hills, California on November 8th, a few hours before the sheriff called Savko. Savko’s journey wasn't nearly as quick. Road closures stretched a 20-minute drive into an hours-long slog. As he finally reached the store, dark and quiet, his car radio crackled with the news that the blaze had jumped the 101 Freeway, a six-lane firebreak of last resort at the foot of the mountains. So he grabbed a hose and got to work, wetting down everything in sight. The last time a wildfire directly threatened the Rock Store was in 1978, when flames encircled the place and looked ready to burn straight down from the ridgeline. Savko's mother, father, and a neighbor retreated to the walk-in beer cooler while a couple of Hell’s Angels went up to the roof with a hose and kept the sparks at bay. The place survived unscathed. Savko climbed up there too; minutes later, he said, "the whole back side of the mountain was glowing." The fire was here. The Woolsey Fire Progression map. 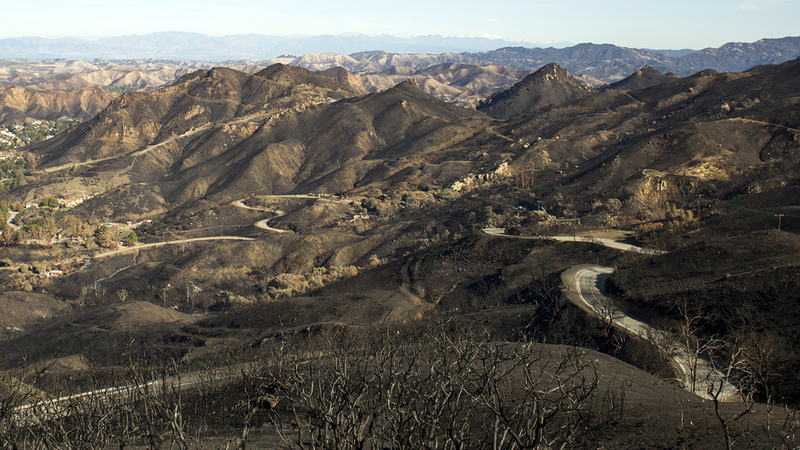 The fire ripped through most of Malibu and the Santa Monica Mountains on November 9th. He ran back down to the parking lot to consider his options as the first embers swirled through the air like a satanic premonition. A sheriff's deputy drove by, yelling for Savko to obey the mandatory evacuation order. Then he saw that the base of a giant oak tree that looms over the property was already on fire and thought, Well, I'm not leaving. He put it out and continued the fight. All the while, the fire’s front line kept running at him, casting the desperate scene in a haunting orange glow. The smoke was getting bad now; soon, the heat grew unbearable. The store's neighbor from up the hill came sprinting down the slope with her dog, screaming. She'd been sleeping, missed the evacuation order, and woke up with flames on her doorstep. Savko didn't know what to do—but that wouldn't matter. "Next thing we know, the fire battalion commander pulls up right in front here, looks at me, and yells, You drop that hose, get in your car, and follow me right now!" Savko said. He wanted to save the store, but he didn't want to die. So he locked the doors and drove away, leaving the little old building under the tall trees with hellfire in the sky. It all seemed finished. The Woolsey Fire burns near Paramount Ranch in the early hours of November 9th, just two miles from the Rock Store. Malibu holds fast in the popular imagination as one of those fancy, beautiful places filled with fancy, beautiful people. An unfathomably wealthy enclave of garish, pseudo-Tuscan mansions behind tall hedges and taller gates, spilling down from the Santa Monica Mountains right up to the ragged edge of the Pacific. But as with every small town—the population is under 13,000—there exists a core of old timers and older places that have stood for decades as the true center around which its spirit revolves. The Rock Store isn't in Malibu proper, but rather a tiny town called Cornell—one of a handful of old ranching communities strung along the mountain ridges soaring above the coast. It's a part of bygone California, a golden place ringed with rugged peaks and towering old-growth oaks and pines. The Paramount Ranch and its old Western Town movie set, most recently used for HBO's Westworld, lie in Cornell as well. There's a population of semi-wild peacocks strutting around. It feels entirely removed from the bustle of Los Angeles, a mere 45-minute drive to the east. The Snake, one month after the flames. Mulholland is a road whose name has crossed into motorcycle and car culture to stand for an entire way of life. It serves as the mountains' asphalt spine, its sinewy curves connecting the small handful of canyon roads leading down to the ocean. Those are rightly lionized in movies, car commercials, and on YouTube—but it's Mulholland that people come from all over the world to ride and drive. Flying up the Snake, as its twistiest stretch is known, it's impossible not to be in awe of the dramatic scenery, the grand hillside homes, and the miraculous squiggle of pavement unfurling beneath you. The Rock Store isn't the only institution up there. There's also the Old Place, an old post office turned restaurant/curio store that was a favorite spot of Steve McQueen in the 1960s. Cornell itself is surrounded by National Park Service land frequented by day-tripping Angelenos for generations. But it's the Rock Store that's fully embraced its role as a Mulholland pit stop over the years, earning its place in riding lore as one of the greatest gathering places for motorcyclists in the country. On any given weekend since Savko's parents bought the old stone building and started a small grocery in 1961—it's only open Friday to Sunday, serving classic diner food plus beer in the afternoon—the parking lot is full of everything from Harleys to Ducatis to $80,000 custom bikes. Celebrities like Keanu Reeves drop by unannounced, and it’s a common filming location for Hollywood crews seeking an old-school backdrop. Everyone gets along in the way you imagine we all used to; as Savko's 90-year-old mother Vern told me, "If you don't come here with a friend, you'll leave with one." The Woolsey Fire started about 10 miles northeast as the crow flies. 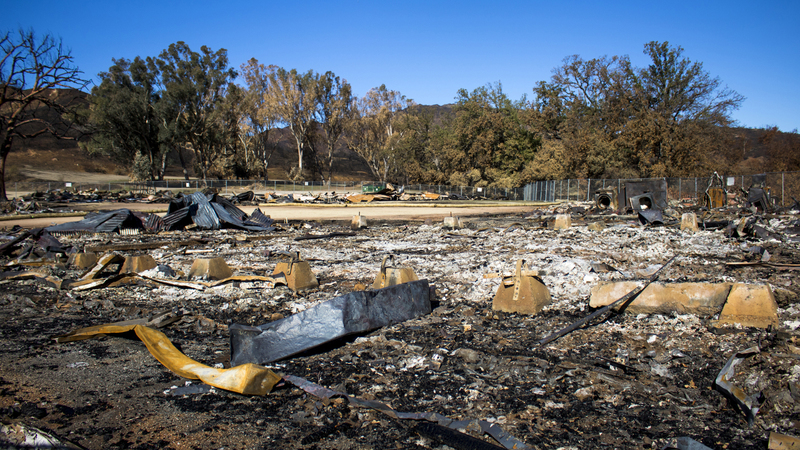 It chewed through neighborhoods and wilderness in equal measure on that explosive first day before hopping the freeway and pushing into the Santa Monica mountains near Calabasas—areas that hadn't seen fire like this in decades. The front line would eventually grow to be over ten miles wide. It was burning hot enough to melt bridges and roads. And it was coming for the Rock Store. What sets a wildfire apart from most other natural disasters is how it pops out of nothing to completely change everything. The same can be said for hurricanes or mudslides or a 1,000-year flood, of course, but those phenomena are tied to active weather patterns that can be analyzed and, for the most part, forecasted. Even tornados, for all their capriciousness, spawn from a distinct set of conditions we've learned to spot well enough to chase. Evacuees stream out of Malibu on the Pacific Coast Highway as the Woolsey Fire burns through on November 9th. Wildfires in California are different. The state is a perma-dry place. With the exception of the rainy winter months, something no longer guaranteed in this climatological era, the stage is always set for a spontaneous inferno. A punishing five-year drought earlier this decade killed vast tracts of pine forest and mountain chaparral in the midsts of an exurban building boom, which only increases the risk of catastrophe. 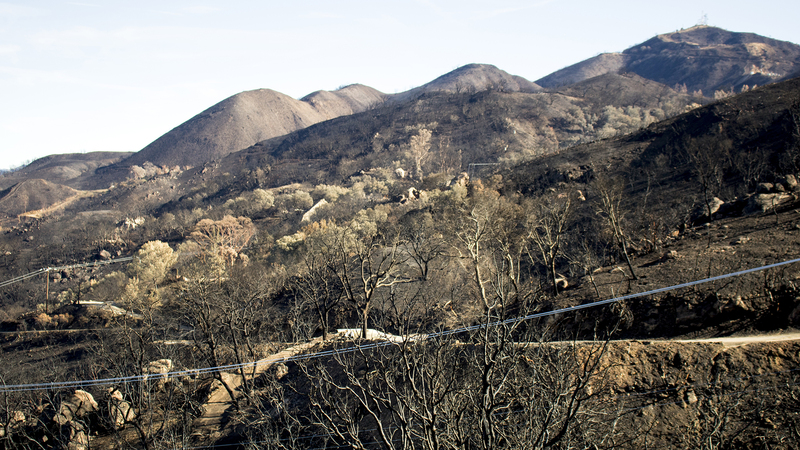 All residents in the so-called "wildland-urban interface"—the very edge of a community’s defensible space for firefighters—can do at the sight of smoke is prepare to get in their cars and hope the escaping traffic isn't too backed up. And also hope the world they're leaving behind is still there tomorrow. We are truly living in unprecedented times. Each year on this warming planet brings a new record fire to California, new visions of apocalyptic neighborhoods, new rounds of harrowing headlines, and new eulogies for places lost. 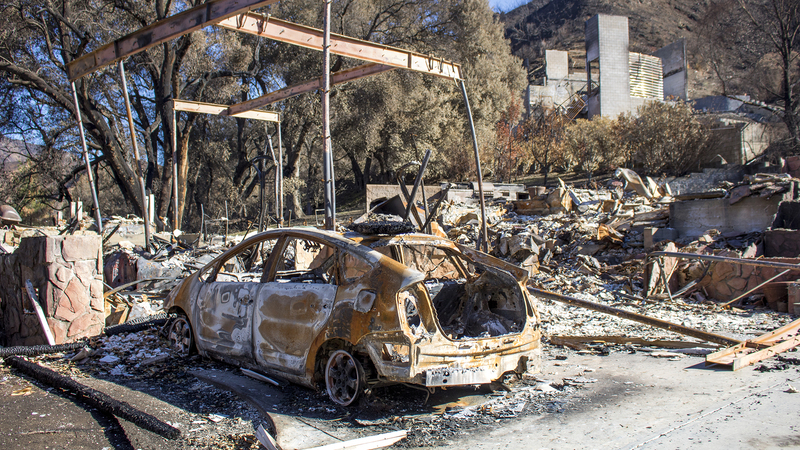 The Tubbs Fire last fall seemed to reorder perspectives when it obliterated entire subdivisions in northern California's wine country to become the most destructive wildfire in state history...until just hours before the Woolsey Fire sparked on November 8, when hundreds of miles away the Camp Fire wiped the town of Paradise off the map and killed at least 88 people. 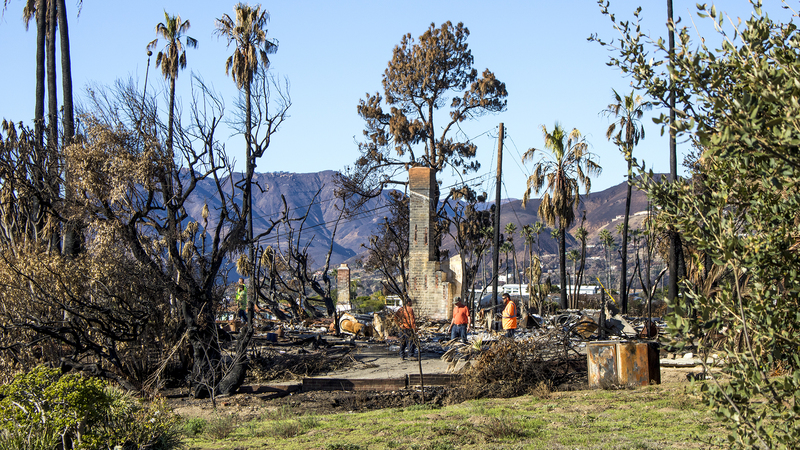 The fire line looms over a house in Malibu on November 9th. The 2018 season was the worst yet. This summer, the Carr Fire outside Redding spawned a thousand-foot-wide fire tornado that rose over the city like a portal to hell. 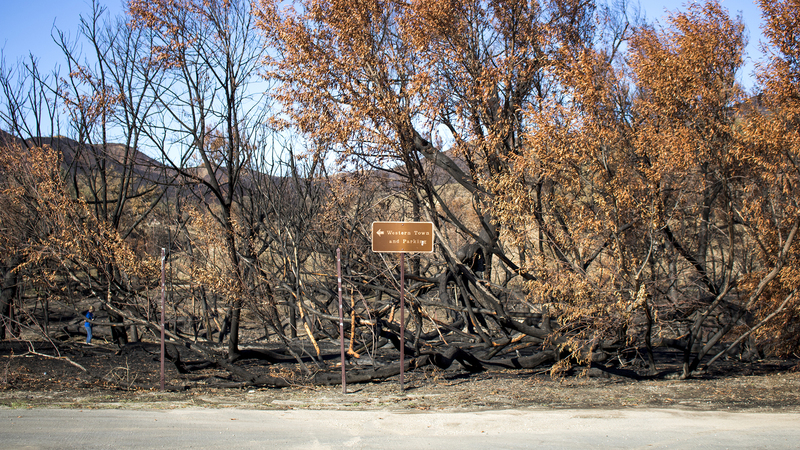 Yosemite National Park nearly burned in July. The Mendocino Complex Fire in the far north charred over 700 square miles, more than twice the size of New York City, to become the largest the state has ever seen. It's starting to get out of control, and the pace isn't slowing. As Savko trailed the fire commander through the choking smoke and down to the coast, he could only think one thing: I have to go back. Area residents know that fully evacuating means returning only when authorities say it's OK—so he pleaded with the fireman to let him into the burn zone as soon as possible. He took shelter at his friend Jed St. Henry's house in Malibu's Point Dume neighborhood along the water. But the fire had followed them, swallowing up the pseudo-Tuscan mansions with their tall gates along the way. A red darkness fell at 10 a.m., and the embers began their malevolent dance once again. Authorities knocked on the door and told everyone to get out. A Malibu resident hoses down houses in his neighborhood as the Woolsey Fire arrives on the morning of November 9th. St. Henry thought about hiding—he told me several of his neighbors did, staying to put out spot fires and saving their houses as a result. But the friends dutifully grabbed what they could and joined a stream of evacuees heading for nearby Zuma Beach, whose parking lot would eventually play temporary host to thousands of stranded residents and hundreds of farm animals forced out of the mountains. They spent a fitful night in their cars by the ocean; St. Henry wasn't about to leave Malibu, and he was itching to get back home. 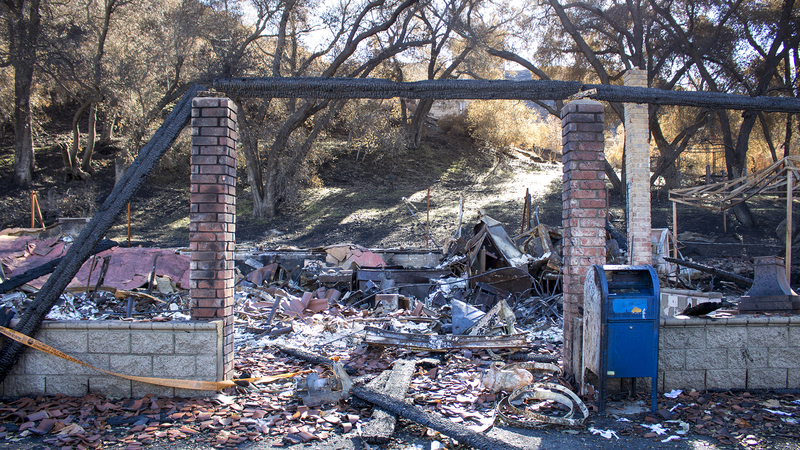 When he finally did, he saw the fire had claimed most of his landscaping, fence, and a box trailer containing 50 years worth of construction tools for his contracting business. His garage roof was singed, but the house was untouched. Others in the neighborhood weren't so lucky. It looked like a war zone, and with road closures forcing remaining residents to ferry in emergency supplies using volunteer boatlifts, it functioned like one too. Point Dume on December 8th. "It’s going to be a year before it’s close to normal again for us, and that's just my little microcosm. We all lost something—the way everything was working so well, you know what I mean? I got little problems here and there, but this..." he trailed off as his face darkened. "Now there's this huge cloud over everything." Likewise, Savko made his way back up to the Rock Store the following day, tracing his way over once-green mountains transformed into an unrecognizable hellscape. He fully expected the place to be a smoking husk by this point, but amazingly, the fire had circumnavigated the building and left it intact save for a damaged roof. The entire property was covered in ash, soot, and broken glass from outdoor tabletops that had exploded in the heat. Everything around it was an unrecognizable mash of blackened earth. Savko couldn't believe his eyes. The fire burned hot enough to melt this steel bridge along Mulholland less than a mile from the Rock Store. But the fight was far from over. He couldn't leave now that he was there, and with no power or cell service, his only link to the outside world was an old landline. Rumors spread on social media that the store has been wiped out (“Oh please,” he laughed), gossip he couldn't immediately counter without internet access. He and the few old-timers who stayed in the area formed 24-hour organized patrols to battle flare-ups as firefighters fought the blaze's westward spread down along the coast. Savko would spend the next three weeks sleeping there without electricity as he worked day and night to bring his little corner of the world back from the brink. That first night back in the mountains, he lit a small campfire in the parking lot to keep warm. Neighbors filtered in and out. 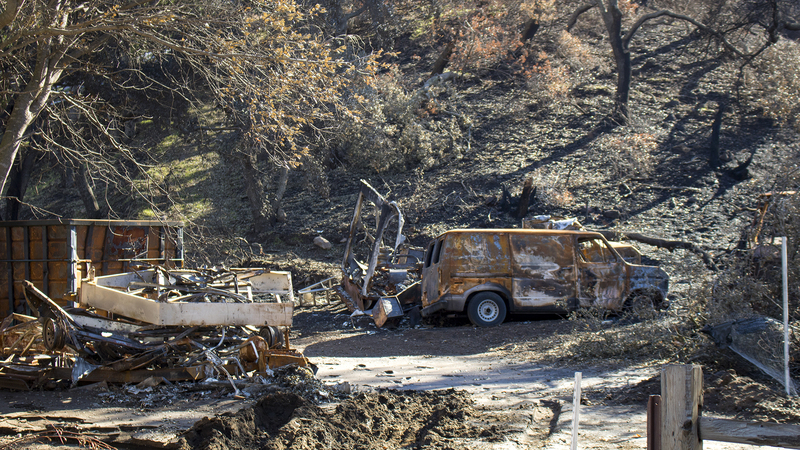 One man had lost everything, fleeing his hilltop property with flames blistering the paint on his old pickup. He nearly died when his escape route was cut off by a locked gate, calling his wife to say goodbye before he managed to break through. Savko couldn't help but feel some form of survivor's guilt. "We were sitting there, and I said 'Gary, what are you gonna do tonight? Your place is gone.' He says, 'I’m not quite sure. But as soon as I leave here, I’m going to go back up there and bury my dogs.'" Savko paused, his voice thick with emotion. "What do you say there? Here I am, all joyous and thankful that the store is still here, and the guy sitting next to me is talking about going up to his burned property to bury his dogs. It’s just so sad." A charred car on the side of Mulholland. November was a blur. Savko's extended residency at the Rock Store was not without its bright moments; with fridges full of soon-to-be-spoiled food, he started an ongoing cookout for passing firefighters. He laughed at remembering their disappointment when he ran out of steak and eggs and switched to hot dogs. He befriended neighbors he barely knew before. The Red Cross showed up within a week with fresh supplies. The local fire station delivered diesel fuel for generators. It was a study in resilience, in coming together over our common humanity. On December 8, one month after the battalion commander ordered Savko to drop the hose and run, the Rock Store finally re-opened. Sitting on the back patio with Savko that day, it was easy to forget about the flames, if only for a minute. The place was a hive of life despite most of Mulholland still being closed, waves of bikers filling the parking lot and filing inside to express their joy at its survival. A few regulars were helping with the last of the cleanup, wiping down windows and sweeping away bits of ash. One asked for a video of his efforts, saying his wife wouldn't believe it otherwise. Sure enough, Keanu Reeves soon dropped by on a group ride organized by his company Arch Motorcycles. Inside the weathered, wood-paneled dining room, Savko's tiny mother Vern sat in her usual seat at front booth, greeting most everyone by name with a warmth that lingered with me days later. The Rock Store on December 8th. Vern sits in the front booth. "We’re all down right now. It’s a sad time, the worst I've ever seen," she said. She was staying in San Diego with her daughter when the flames came, and all she wanted to do was check on the store and her son. It was impossible. "When they wouldn’t let me in, I said, I’ll walk up there if I have to. But they wouldn’t give in." Rich slipped away to greet more old friends while Vern continued holding court in her booth. A family of four strolled over to say goodbye on their way out—it was the local sheriff, the one who made that fateful 2 a.m. phone call to Rich, with his wife and two young boys. The brothers were arguing loudly over a large stick, and the father told his progeny to take it outside. "Typical sheriff," another regular smirked. He rolled his eyes and chuckled in response. It was a beautiful, cacophonous, carefree moment, the kind that's been hard to come by lately. Still, the talk around the dining room was mostly about the fire. The connection people feel to the Rock Store runs deep—that much was clear from Gary Pattee, another devotee of the place and a friend of Savko and St. Henry. 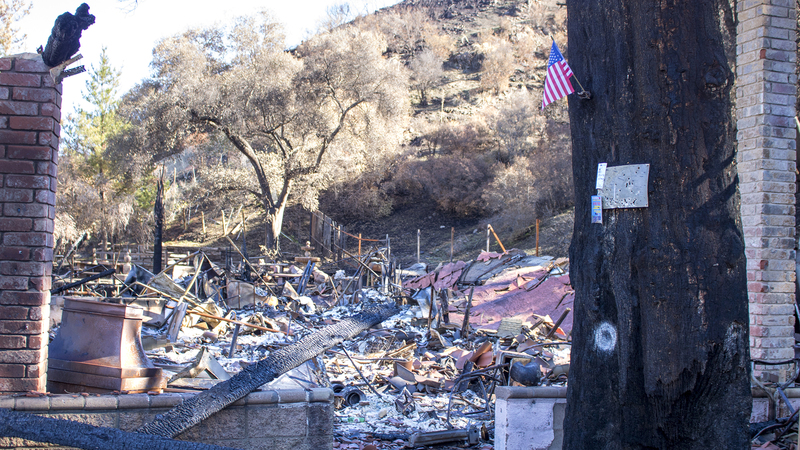 He elected to defy the first evacuation order and defend his house in nearby Lindero Canyon, staying until the very last minute as the fire raged at the end of his street. Its demonic roar still echoes in his head. As he and his wife fled up the coast, he was filled with an immense sadness seeing the giant smoke plume in his rear view mirror. He had no idea if his friends made it out alive. "I got a text from my buddy that said, the Rock Store’s gone. And I'm crying. I am crying in a parking lot reading that," he said, still shaken from the memory. Even the potential loss of his own house didn't strike as hard. "This is our place. It’s an iconic place. The guys who are attached to it, they’re with it forever." Vern’s face shone with a misty happiness as Gary explained his undying love for the store, the way he used to race some of the old Hollywood guard up here early in the mornings when he first started coming (winner bought the coffee), and his elation when he heard it had survived. She touched my arm as he finished talking. “You couldn’t ask for a better group. You just couldn’t,” she said softly. The Woolsey Fire burned for almost two weeks, scorching 88 percent of National Park Service land in the mountains and incinerating over 1,500 structures. A 3,000-strong firefighting force finally extinguished the last of it on November 21. The Rock Store survived, but many, many other homes and businesses in the 150-square-mile burn zone did not. Less than a mile up Mulholland from the Rock Store sits a trailer park called Seminole Springs where 100 packed-in coaches went up like a matchbook. Savko still can't believe everyone made it out alive. Three people would die in the fire, two of whom were found in a burned car that crashed further up the road. The view from the top of the Snake. The Snake is still closed, as is much of the road’s western half and a handful of other mountain routes. I talked my way past the closest police barricade and walked down to the iconic turn. I recognized the contours of the road, which also melted in places, but the rest of it was a Martian landscape of scorched hills and ashy trees; below, a small island of green stood where firefighters managed to save a few homes amid the chaos. A scorched smell lingered in the air. It was deafeningly quiet and will be for a while. I used to drive Mulholland all the time, and seeing it so unmoored from how it still looks in my mind was deeply unsettling. In places, the destruction is absolute. Charred husks of cars sat in driveways now leading to nothing. Plastic fences lay dribbled across the ground like a Dali painting. Roads that once wound through sublime scenery now chart a course into utter ruin. Down at the coast in St. Henry's area, the damage is as random as a single ember's flight; bombed-out houses lie in ruins next to their untouched neighbors. Gary Pattee’s home made it through, probably saved by his last-minute stand, but seven others in his neighborhood burned. It’s still a long road back to normalcy, and hopefully an even longer time before the inevitable sequel. After all, the fuel has been spent; years will pass before there's enough vegetation to burn once more. The bigger danger is mudslides. The hills are destabilized without their organic cover, and early winter rains have already brought a car-sized boulder crashing down on Mulholland. “It’s like, geez, one thing after another,” Savko said with a weary sigh. But the crowd that assembled at the Rock Store’s first day back shows why he’ll never call it quits. He can’t. There’s too much history wrapped up in the place, stories and memories and a family legacy that’s as fireproof as stone. It’s as much an anchor to the land as the new grass already growing on the barren hills, or Mulholland Highway itself. Everyone needs it: the motorcyclists, the drivers, the local authorities, the new friends, the old timers, the film crews, Vern, and most of all, Savko himself.